Watch a item and wait for it to drop to your desired price! item 4 RISE OF THE TOMB RAIDER: 20 YEAR CELEBRATION - INCLUDES COLLECTOR’S BOOK! -RISE OF THE TOMB RAIDER: 20 YEAR CELEBRATION - INCLUDES COLLECTOR’S BOOK! When I first started playing this game, I was a little overwhelmed with all of the missions, side quests, and achievements there are to get. After playing it for some time, this actually become one of my favorite aspects of the game. The game is just so vast and all the different landscapes, truly make this game special. The story is a bit generic and predictable, but with everything this game has to offer, I can forgive that. The game is worth it and I highly recommend it. 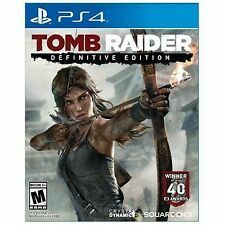 If your a Tomb Raider fan, then this game will not disappoint. The makers of this game kept true to the Tomb Raider culture. There are few new game play functions, but nothing too alarming. The graphics in this game is really sharp. The game world is very interactive, and you can spend hours on one setting just searching and hunting. If your a fan of Tomb Raider, this will make you very happy. So fun and engaging, although more puzzles would have been nice. As always a great overall experience from story to gameplay. This is automatically a given with any game from Tomb Raider franchise though. One of the best on Ps4! Great game with great visuals and fun play... if you like Horizon Zero Dawn you need to pick this up. The story and cut scenes were better than any Hollywood movie made in the last few years. Game play is not quite as fluid as Horizon, but is still fun and engaging.